Quote: The central theme of Shout Praises! Kids 4 shines in a joy-filled song called "Hey Jesus Loves Me" when the children repeatedly sing, "The greatest thing that there could ever be is that Jesus loves me." FYI: There sure was a lot of shouting and praising for this project's predecessor. Shout Praises! Kids 3, won the Gospel Music Association's 2004 Dove Award for Children's Music Album of the Year. The Bottom Line: Thank God for kid-friendly, modern Christian music. It can energize and uplift a family's house in ways that television never does, and at church, it is often the best way of putting young ones at ease and making that week's Sunday School lesson fun and memorable. This new recording is well done in every respect, from song selection and creative arrangements to enthusiastic performances and clear messages. Importantly, the kids play a major role throughout by singing along and even taking some lead-vocal parts, and reading scriptures on select tracks. Featuring: Straight-ahead upbeat rockers like "Rooftops" and "Better Than Life," a kid-cool, '80s-is-back electronic production of Matt Redman's "Blessed Be Your Name." The simple, wide-eyed lyrics to Michael Gungor's "Friend Of God" anthem work especially well aimed at this young audience. "Holy Is The Lord," a new favorite written by Chris Tomlin, closes the set. 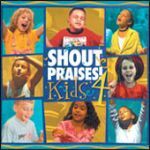 Save $2 on the Shout Praises! Kids 4 CD & Songbook set when you buy from Songs4Worship.com!